Black Ice Software - Tiff Viewer version 11.51 is released! New features for batch scanning and to restrict file saving into a specific directory and more! Black Ice Software has released version 11.51 of the Tiff Viewer. 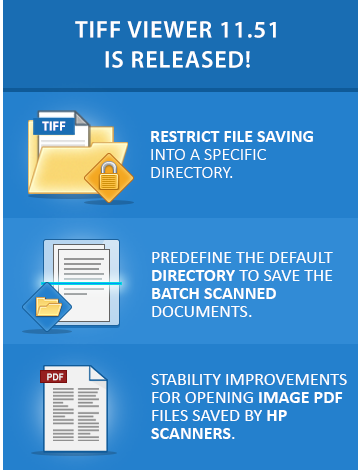 This version includes new useful features for Batch Scanning documents with the TIFF Viewer. By using the new features, one can predefine the default directory for saving scanned documents. The latest release of TIFF Viewer version 11.51 also includes new features for Administrators to restrict file saving into a specific directory. This feature is useful when Administrators want to restrict User’s access to different directories when saving documents, allowing Administrators to keep all the documents in one directory. Version 11.51 of the TIFF Viewer includes further stability improvements for opening Image PDF files saved by HP scanners. The latest Tiff Viewer also includes stability improvements for opening Email Settings with more users simultaneously on multi-user systems, such as Citrix.